The Chinese Shar-Pei has a medium-sized muscular build. Its signature wrinkles on both its face and body enable it to twist away when grabbed by another dog in a fight. This dog breed was once used as a fighting dog, but now is considered a dog that is friendly and good natured despite its scowling expression. The Chinese Shar-Pei originated in China. Chinese Shar-Peis range from 18 inches to 20 inches. Chinese Shar-Peis range from 35 to 45 pounds. 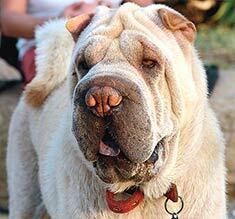 Chinese Shar-Peis are typically black, red, chocolate, cream or fawn. Chinese Shar-Peis have straight and harsh coats. Coat lengths can range from being extremely short to one inch in length. Regular brushing is required. 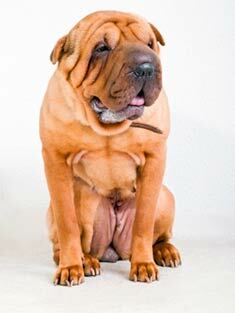 The Chinese Shar-Pei is a dominant and independent dog breed who is loyal to its owner. Suspicious of strangers, the Chinese Shar-Pei makes a good watch dog. The Chinese Shar-Pei is susceptible to skin and eyelid problems. The expected life span of the Chinese Shar-Pei is 8-10 years. Chinese Shar-Peis need frequent exercise. A fenced yard and plenty of stimulation is essential for this independent and affectionate dog breed. The Chinese Shar-Pei is in the Non-Sporting group. Find Chinese Shar-Pei Puppies with our Free Breeder search!